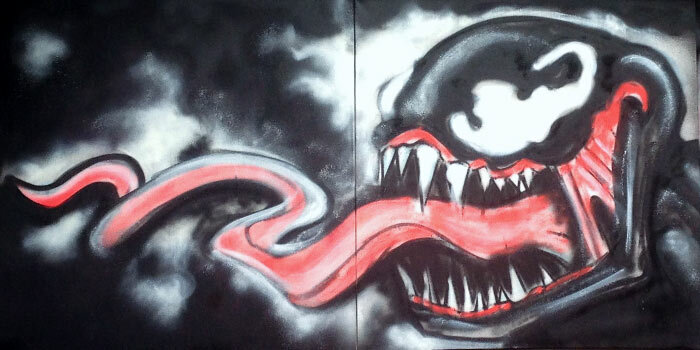 This Venom piece took around 4 hours to paint and was spread onto 2 1m x 1m canvases. 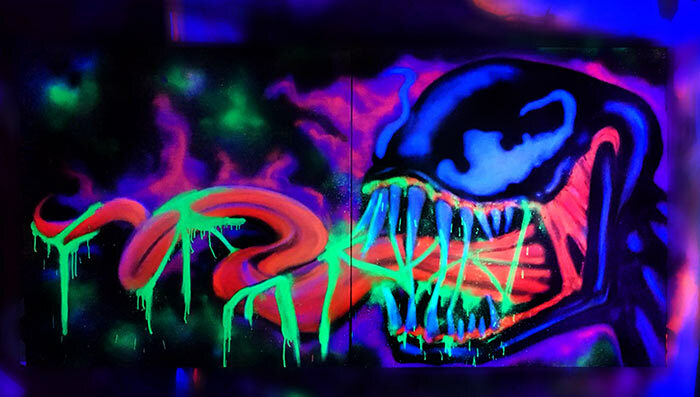 I painted it in daylight so the end result when exposed to black light was a bit of a pleasant surprise, normally i paint with the UV light turned on. I used Montana gold flouro range spray paint and the Montana black infra series. The paints worked well together. I took some photos during every stage of painting process, I’m not saying this is necessarily the best way to about the task, but it seems to work for me. 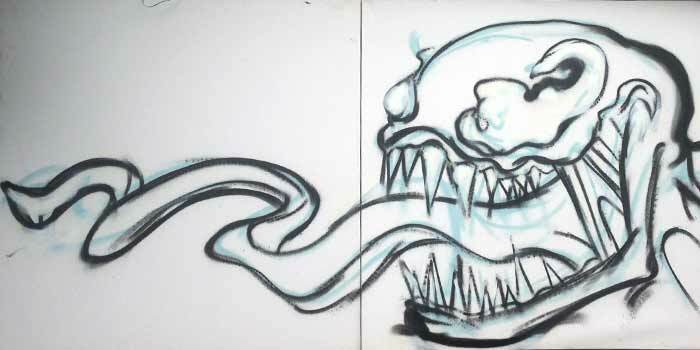 Below, rough sketch (blue) and outline (black) – I painted a rough initial sketch outline using a very light blue spray paint, at this stage even if I mess up it’s not a big deal. The lines serve for knowing how to space out the canvas properly, luckily I got it right more or less first time with the black outline which followed. I didn’t need to prime the canvas as enough paint would go down on every part of the canvas so it would pretty much prime itself. Very rough colour fill – I always try to do a rough colour fill to get a good idea of balance, I started with the colours that were needed for sure. 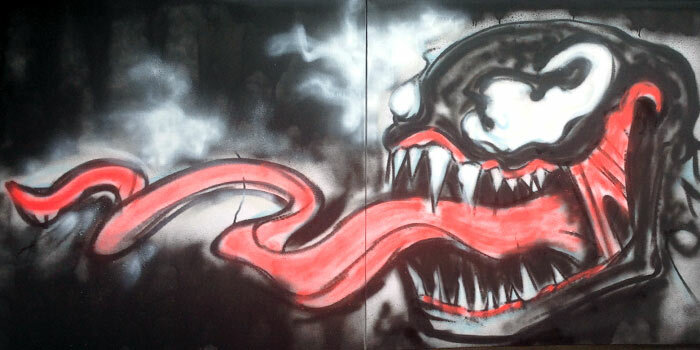 Venom being black as a main colour and red for the tongue fleshy details so these colours went down first. 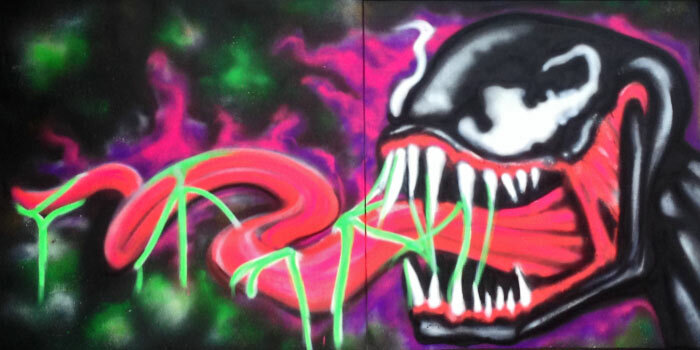 Although I knew I wanted to add venom green neon slime around the mouth I couldn’t add it at this stage as it would mean having to re-add everything all over again, so I just mentally photoshopped it on. If at this stage I felt there was too much of one colour I could re-sketch and re-balance. Tighten it up, a less rough fill – Seeing as everything was looking good I decided it was time to start tightening up the piece. 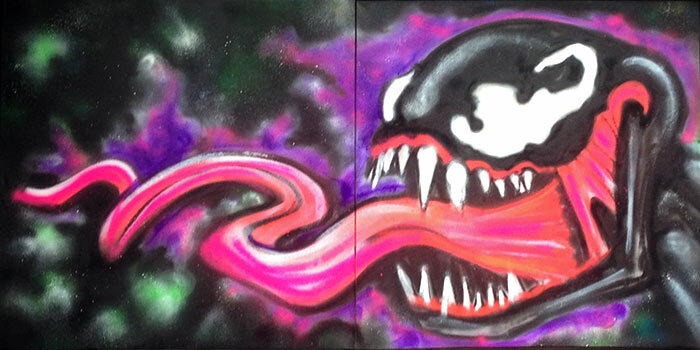 In order to make Venom’s head pop out from the canvas and not fall into the galaxy type background I decided to paint a sort of comic book style aura. Seeing as the balance was looking good and I was to add neon green later I figured a nice purple would work as Venom’s comic book style power aura. Add purple aura – The only colour which was in the Montana Black infra range was the purple background. Initially i wasn’t sure if the 2 paints types would work well together, the paint worked perfectly. 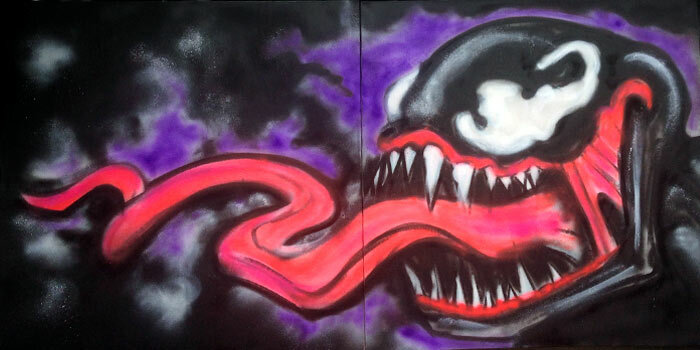 I also added a bit more fill to tongue and Venom’s body. Base layer detail – Now that all the layout and basic details are down on canvas it’s time to start tightening up. The first stage is to finalise the background details. I added some splatters of neon paint onto the black background to give a sort of neon galaxy effect. 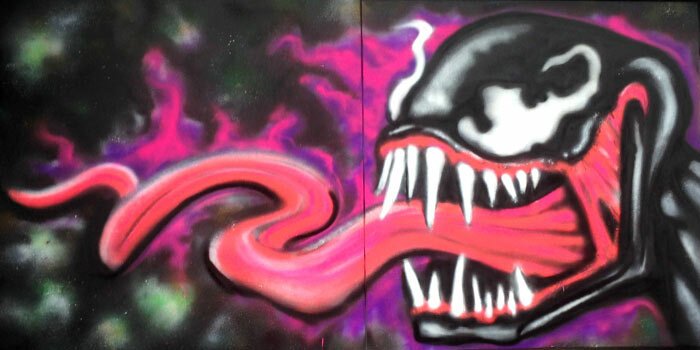 I also added some pink tones to Venom’s tongue and fleshy parts to give a bit of gradient, Montana’s fluorescent range cover and blend with each other perfectly. I added a bit of pink onto the aura to give the overall effect some hints of energy flow. 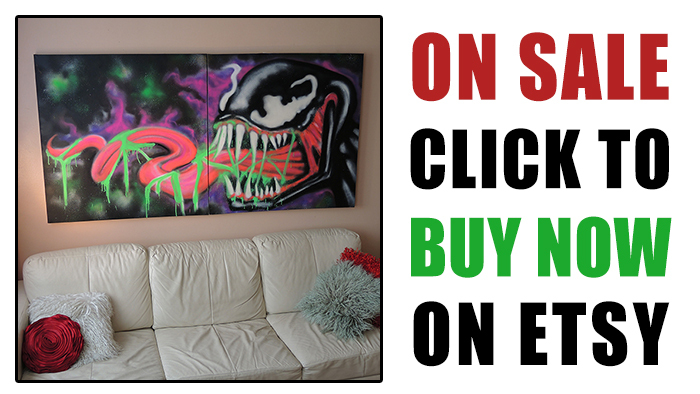 Background finalised, work on Venom – With the background finished I’m now tightening up all the details on Venom and the shading work. I’m trying to imagine the whole time what it will look like once only the neon elements will be visible. In order to give the piece a rich black light depth I’m layering colours with hints of darker or lighter shades. Although I can’t see it I’m adding disco white colour to certain areas to highlight certain parts. Now that I’m finished with the tongue I am extending and finalizing Venom’s teeth. The final piece in normal day light – Finally as difficult as it was I tried to not add to much outlines, I also went over all the white pieces with Montana disco white to accentuate certain parts of the piece.